Economist Jerry Robinson shares three of his favorite long-term cryptocurrency investments in this wide-ranging discussion marking the release of our brand new 2019 Cryptocurrency Investment Report. On this week’s podcast, listen as Jerry Robinson shares trading lessons that he has learned from five of the world’s greatest stock traders. With cannabis still illegal in the U.S. despite growing calls for deregulation and even legalization, now could be one of the best opportunities to begin building an investment portfolio of high-quality stocks that will benefit from the inevitable shift in U.S. and global laws towards cannabis. On this week’s broadcast, economist Jerry Robinson exposes the immoral nature of America’s debt-based paper money system and encourages listeners to protect themselves through financial wisdom. On this week’s broadcast, Jerry Robinson is joined by gold mining analyst/expert Jay Taylor to discuss the topic of investing in gold mining stocks. Many fortunes have been made (and lost) in this exciting industry. Later, Jerry shares his four favorite ETFs for trading gold mining stocks. This week, we unveil the details about the upcoming 2019 Follow the Money Summit and Trend Trading Bootcamp to be held in Rogers, Arkansas. Make plans to join us for a special weekend of powerful investing insights and income ideas to turbo-charge your finances into 2019 and beyond! This week, Jerry and Jennifer Robinson explore four innovative industries of the future: Solar energy, Blockchain technology, China internet, and Cannabis/Hemp. Learn how we are playing each of these innovative industries on today’s podcast! The ‘millennial’ generation has been called one of the most ‘financially savvy’ generations in recent memory. In this week’s podcast, Jerry and Jennifer Robinson are joined by precious metals expert Tom Cloud to discuss an important financial knowledge gap in the millennial generation, and how to solve it. On this first podcast of 2019, Jerry and Jennifer Robinson answer your questions on trading and investing and even share some of their favorite sectors and industries for traders and investors to focus on in the New Year. On this final podcast episode of 2018, Jerry Robinson looks back on 2018 and shares how he is helping people just like you learn to profit in up or down markets. He also provides his latest market commentary on U.S. stocks, gold, and cryptocurrencies. As global markets cratered earlier this week, gold prices woke up and burst above a key resistance area that could launch a new rally in the yellow metal. Join economist and trading coach Jerry Robinson for an interview with special guest expert Tom Cloud, a 40-year veteran in the precious metals industry. On this week’s broadcast, economist Jerry Robinson delivers a powerful update on the crumbling petrodollar system by breaking down the recent — and unprecedented — events surrounding the U.S.-Saudi Arabia relationship and how it could impact America’s economy and especially the U.S. dollar. This week, we are joined by legendary investor and world traveler, Jim Rogers. He shares his latest insights on the U.S. economy and the ongoing economic war between the U.S. and China. Later, enjoy listening to a 15-minute excerpt from Jerry Robinson’s lecture “12 Lessons from the World’s Greatest Stock Traders” from the 2018 Follow the Money Summit. On this week’s broadcast, economist/author Jerry Robinson is joined by precious metals expert Tom Cloud to discuss why platinum prices could be on the verge of a new rally. Financial independence is a worthy goal and can be obtained if you apply the right financial principles. In today’s broadcast, economist Jerry Robinson shares seven wisdom keys to achieving financial independence. Later, an update on precious metals with Tom Cloud and a smart retirement tip on creating a retirement income that you cannot outlive from Mike Mitchell. PODCAST: Listener Q&A with Jerry Robinson – Best Books for Traders, Top China Stocks, etc. 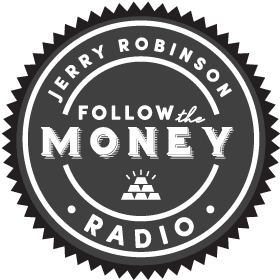 Ever on a mission to educate, trading coach Jerry Robinson is joined today by his wife Jennifer, who is a also a professional educator, to answer questions from Follow The Money listeners. And later, Tom Cloud shares an eye-opener… what is the real cost you are paying when you buy silver and gold? After years of Western propaganda paving the way for the invasion and occupation of North Korea, which sits right on the Chinese border, the Pentagon’s best-laid plans have gone up in smoke. This week, economist Jerry Robinson explains how the new “peace” on the Korean peninsula may be playing right into the hands of Beijing and its own aspirations of regional dominance. Later, an update on the tax laws affecting cryptocurrency investors. Finally, Christian financial advisor Mike Mitchell challenges listeners to regain their focus when it comes to their retirement plan. On today’s broadcast, economist and best-selling author Jerry Robinson explores China’s new yuan-backed oil futures contract designed to gain a profitable edge in the global oil markets, at the expense of the petrodollar system. Later, Tom Cloud shares exciting news in the metals market, and Christian advisor Mike Mitchell discusses a retirement planning jewel – tax-free income.Listen to “The Petroyuan vs. the Petrodollar: What You Should Know” on Spreaker. Since the dawn of mankind, gold and silver have been valued as a store of wealth, a precious and costly gift, and the preferred form of money. In today’s show, Christian economist Jerry Robinson is joined by veteran precious metals advisor Tom Cloud for his expert view of the bright and shining future of gold and silver.Listen to “Gold Investing in 2018 (Plus, 3 Top Gold Mining Stocks To Watch)” on Spreaker. On this week’s broadcast, economist/author Jerry Robinson lays out the Follow the Money philosophy on cryptocurrency investing and is later joined by legendary Bitcoin investor, Trace Mayer, to discuss the current state of the cryptocurrency market. Also, precious metals analyst Tom Cloud explains what investors should know about the gold-silver ratio, and Christian financial advisor Mike Mitchell shares his foremost secret for a successful retirement.Listen to “Cryptocurrency Investing for the Long-Term” on Spreaker. On today’s broadcast, trading coach and internet entrepreneur Jerry Robinson is joined by protégé Steve Penny to discuss Steve’s relatively short journey to amazing internet success under Jerry’s tutelage. Later, Tom Cloud answers a listener question about gold and interest rates, and Christian advisor Mike Mitchell explores the option of a reverse mortgage in retirement.Listen to “The Secret Recipe For Making Money Online” on Spreaker. On today’s broadcast, trading coach and successful internet entrepreneur Jerry Robinson shares exciting news about the 2018 Follow the Money Summit, as well as a sneak peek at the scheduled lineup. Later, precious metals expert Tom Cloud reports on the U.S. deficit and gold, and financial advisor Mike Mitchell relates surprising ways to use life insurance in retirement.Listen to “Announcing the Follow The Money Summit 2018” on Spreaker. 42% of Americans have less than $10,000 in retirement savings. On today’s broadcast, economist Jerry Robinson encourages you to not be a part of that statistic by offering powerful, yet simple, advice for your journey towards financial liberty. Later, precious metals advisor Tom Cloud weighs in on the gold markets, and financial advisor Mike Mitchell shares the best way to spend your federal or state income tax return.Listen to “Financial Liberty is Within Reach” on Spreaker. In today’s episode, economist, Trading Coach, and best-selling author Jerry Robinson lays the foundation for trader success in carving out consistent profits in the market.Listen to “Two Vital Keys For Trading Success” on Spreaker. PODCAST: Is Your Financial House In Order? In this episode, economist and trading coach Jerry Robinson delves into Follow the Money’s Five Levels of Financial Freedom and teaches us how to seize control of our financial future now.Listen to “Is Your Financial House In Order?” on Spreaker. In this episode, we’re switching it up a bit, as Founder and CEO of Followthemoney.com, Jerry Robinson sits on the opposite side of the table – as the interviewee. The host of FinanceandLiberty.com, Elijah Johnson, asks Jerry for his perspective on gold, cryptocurrencies, the state of the stock market, and what 2018 may hold for traders and investors.